In the 1960s, the cutlery industry emerged in Hong Kong thanks to the UK government’s policy of Commonwealth preference which favored imports from HK over Japan. The industry grew very rapidly in the early 1960s, with total exports grew from HK$646,748 in 1961 to $5.4 million in 1963 with the UK accounting for over 57%. The five key players in the industry from that era were Chuang’s Cutlery, Trinity Tableware, Foo Kwong Cutlery, HK Tableware and Good Friend Industries. The first four firms were founded by prominent merchants from three distinct ethnic groups: Chuang’s which pioneered the industry was the brainchild of Chuang Chung-wen, one of the longest serving and best remembered heads of the Chinese Manufacturers Association (referred to as the CMA hereafter); Trinity and Foo Kwong were affiliates of Abdolally Ebrahim & Co, one of the oldest Indian trading houses in Hong Kong; and HK Tableware was operated by Hans Diestel, a prominent Jewish businessman from Shanghai. The industry remained strong until the mid-1970s when the rising cost of production (land and labor) forced companies to shut down or move production overseas. 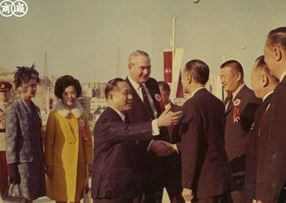 Chuang Chung-wen (shorter figure in the center) showing the Colonial Secretary (taller figure in the center) the Chuang’s Cutlery display at the 26th HK Products Expo in 1968. Founded in 1960, Chuang’s Cutlery was the first, largest and most prominent player in the industry and while its founder Chuang Chung-wen (莊重文, 1912-1993) was involved in many different industries, he was best known as the “King of Cutlery”. A native of Chuanchow in Fukien province and born into a family of Chinese doctors, Chuang graduated from the Chi Mei Naval School (集美航海水產學校, predecessor of Jimei University) in Amoy in 1932 and went to work for a seafood processing company in Singapore owned by the founder of his alma mater, the prominent Singaporean Chinese rubber industrialist and philanthropist Tan Kah-kee. After the collapse of Tan’s business empire in mid-1930s, Chuang worked as a teacher in Singapore before moving back to Fukien where he became the head of the tea department of the Fukien Provincial Agricultural Company. After the War, he moved to Hong Kong where he dabbled in shipping between HK and Macau before setting up his own trading firm to export tea to Southeast Asia. 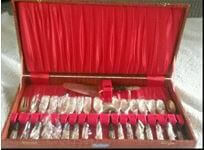 In the early 1950s, Chuang established Hong Kong Ve-Lit Manufacturing (香港味力廠), a maker of gourmet seasoning powder. 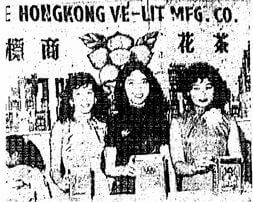 Ve-Lit’s line of gourmet powder was popular in Southeast Asia and the firm was a staple in the CMA HK Expos in the 1950s. The profits from Chuang’s powder and tea trading businesses allowed him to finance new ventures and looking for unique business opportunities with no/little competition. He settled on stainless steel cutlery at the suggestion of the Director of Industry & Commerce. In 1960, Chuang invested HK$2 million to establish Chuang’s Cutlery in Kwun Tong, the first stainless steel cutlery factory in Hong Kong. The 12575 square feet, 2 story plant at 4 Hing Yip Street was equipped with the newest equipment from Germany and Japan with capacity to produce 60000 pieces of cutlery per day. The plant went into production in June of that year but due to lack of experience amongst its 130 workers, daily production was only at 16000 pieces per day by the end of the year. Orders were also not coming in initially as buyers were taking a wait and see approach but Chuang remained committed and by 1963, orders were flooding in from Europe and Canada, especially from the UK where Viners, the major cutlery firm from Sheffield was a major client. In 1967, Chuang’s and Viners formed a joint venture to jointly market their products in the global market. To the meet the growing demand, Chuang’s built a 10 story, 89855 sq ft plant at 51 Hung To Road in Kwun Tong, allegedly the largest cutlery factory in the Far East. Starting from the 1950s, Chuang Chung-wen had served on the board of the CMA and in 1968 he was elected chairman and was re-elected three times, serving until 1974. During his three terms, he not only presided over the highly successful annual HK Products Expos but led many delegations to and negotiations with foreign countries to promote and protect the interests of the HK industries. His collection of speeches was compiled into a book entitled “The Growth of HK Industries” (香港工業之成長) which is an important archival document for the golden age of HK’s industrial development. 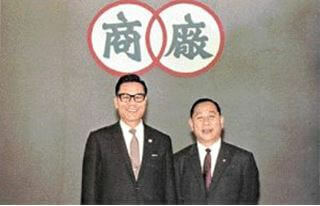 Chuang Chung-wen (right) with Sze-Yuen Chung in front of the CMA logo. 1971 was a banner year for Chuang’s Cutlery. In June, Viners awarded a US$10 million (HK$60 million based on exchange rate at the time) contract to Chuang’s Cutlery for production of stainless steel and brass tableware over 5 years, one of the largest single order a HK manufacturer had received. To fulfil these big orders, Chuang’s built another 10 story, 84051 sq ft building at 49 Hung To Road adjacent to its other plant. In July, Chuang’s Cutlery (with paid up capital of HK$20 million) went public on the Far East Stock Exchange and Kam Ngan Stock Exchange, issuing 1.62 million new shares at HK$4 a share and the IPO was four times oversubscribed. At the time of listing, the firm held three industrial properties worth HK$8.42 million in Kwun Tong –and two new facilities to handle the new orders. The US quota imposed on lower end cutlery (primarily made by Japanese cutlery manufacturers out of the Niigata region which counted over 2000 cutlers) in October of the same year has minimal impact on Chuang’s since its focus was higher end cutlery and it primarily shipped to the European market. At its peak, Chuang’s Cutlery was churning out 500,000 pieces of cutlery per day. It employed so many workers that 4 armed robbers targeted its payroll delivery at one of its Kwun Tong plants in December 1972 and walked away with HK$300,000 in cash (thankfully they were arrested a month later). In June 1973, Chuang’s opened its first retail showroom at the ground floor of the CMA Building at 64-65 Connaught Road Central, which was opened by Eric Ho (何鴻鑾), then Director of Industry & Commerce. 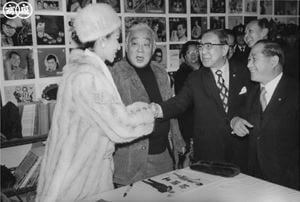 In addition to Chuang’s cutlery products, the showroom also marketed products of Viners and Mikasa of Japan, both of which had appointed Chuang’s as its master distributor in Southeast Asia. In 1974, PT Chuang’s Cutlery was established in Indonesia and the group also had a plant in Singapore. With the proceeds from listing and profits from cutlery, Chuang’s diversified into other fields such electronics (Lambda Electronics) and garments (Sintex Nylon & Cotton in Singapore) in the 1970s but really went big into properties which became a focus of the group. Over time the cutlery business fell to the sidelines and in 1994 (1 year after Chuang’s death), Chuang’s eldest son Alan Chuang and son in law Bill Siu bought Chuang’s Cutlery Indonesia for $4.246 million and Chuang’s Cutlery & Holloware, then a loss-making business for $2.46 million from the listed holding companies Chuang’s Consortium and Uniworld. Trinity Tableware and Foo Kwong Cutlery were both associated with Abdoolally Ebrahim & Co (祥记洋行 in Chinese, refer to as AEC hereafter), one of the oldest trading houses in Hong Kong founded in 1842 and operating out of its head office at Abdoolally House at 20 Stanley Street since 1920. Its founder Seth Ebrahim Noordin, a member of Dawoodi Bohras, a trading community of Muslim denomination, came to HK from Mumbai in 1841 with the British East India Company, months after the establishment of the colony. In its first century, AEC primarily focused on the trading of commodities such as cotton, silk and tea. 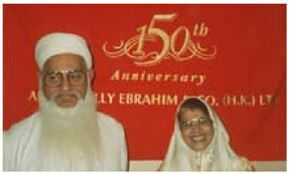 Shaik Jaffer A. Ebrahim, who started AEC’s houseware business in 1961 and later became the sole owner of the group in 1988 with his wife at the group’s 150th anniversary in 1992. Foo Kwong’s factory was located at 355 Chai Wan Kok Street in Tsuen Wan. In 1964, Foo Kwong lost a trademark infringement case involving Chuang’s and was fined HK$4500. In 1966, Foo Kwong laid off 110 workers which resulted in a major labor dispute that lasted for months. By 1968, Foo Kwong was producing cutlery for AEC to the tune of US$1 million with a focus on high quality cutlery. Another AEC affiliate – Trinity Tableware was incorporated in 1963 (although it appeared to have started in 1961) and like Foo Kwong also had its factory on Chai Wan Kok Street in Tsuen Wan. The 1964 Nigel Ruscoe’s Annual HK Register, seems to indicate that Trinity was the leading firm at that point after having overcome its polishing problem and introduced new styles of cutlery featuring nylon and urea handles. In 1970, the group designed a 5-piece stainless steel Georgian tea set and sold 30,000 sets per month to Ensee Ltd, in the United Kingdom and in 1972, the group exhibited in the Cologne Housewares Fair and Frankfurt International Spring Fair for the first time. AEC continued to operate Foo Kwong until 1978. (Although the company was not formally dissolved until 1983). Trinity was dissolved in 1974. Today the houseware division remains one of the key business of the group but it is no longer involved in cutlery manufacturing. AEC founder Seth Ebrahim who also started the first ferry service between Tsim Sha Tsui and Central which predated the Star Ferry. 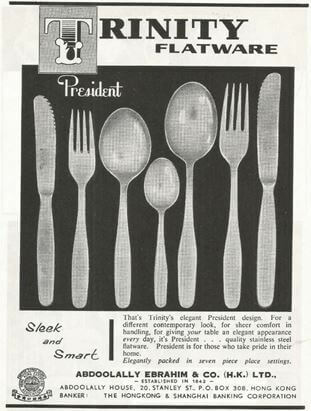 HK Tableware was incorporated in 1959 but likely did not go into production of stainless steel cutlery until 1961. It was said that the firm was “originally helped” by the trading house of Davie Boag but it was primarily operated by Hans Diestel. Diestel arrived in Shanghai in 1931 and married Claire Kammerling (who went by “Lala”) in 1933. Claire’s father H. Kammerling worked for Jewish charities in Shanghai for over three decades and the couple were active in the Jewish community in Shanghai before 1949. One of their friends was Morris “Two Gun” Cohen, the legendary Jewish aide de camp to Dr. Sun Yat-sen.
During the Japanese occupation, the Diestels resorted to grounding assorted grains in their living room by hand using a Chinese millstone and selling the meal to Red Cross for cash. Later they opened a shoe factory employing Jewish refugees and according to Diestel never had problems with raw materials since the Japanese thought he was German. According to old directories of Shanghai and HK, Diestel’s trading firm H. Diestel & Co was headquartered in the HK Bank Building in Shanghai with branch offices in HK (Edinburgh House) and Nanking. The firm was agent of Bishopsgate Steels of London in China. In addition to Diestel, a Chinese by the name of T.Y. Lok was listed as director of the firm. Since stainless steel is a major component of cutlery (80% of which were imported from Sweden and Japan), it was likely that Diestel’s metal trading background led him to cutlery manufacturing. In 1961, he formed Metal & Textile Traders Ltd (美德工業貿易), also known as Metex. As the name implies, Metex was involved in the trading of both metals and textiles but it was also listed as the manager of three companies – HK Tableware, Gold-Flex Elastic (incorporated in 1974, dissolved in 2009) and Sportswear Ltd. It was also the agent for Teenform, Inc., a leading American brasserie manufacturer and A.B.M. Industrial Products Ltd, a UK producer of chemical products. Directors of the firm included Hans, his wife Lala and Gustav Diestel. HK Tableware’s initial plant was located at Tai Hom Village in Diamond Hill in Kowloon where it employed over 100 workers. In 1966, a fire damaged its plant and a dozen machines inside worth HK$50000. A neigboring latex factory was also affected. By the early 1970s, HK Tableware was operating out of Ta Chuen Ping Street in Kwai Chung. In October 1974, HK Tableware laid off its around 100 workers and settlement in terms of severance payment was reached after the Department of Labor intervened. The firm was not dissolved until 2002. 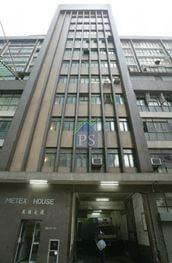 In 1974, Metex built the 11 story Metex House at 24-37 Fui Yiu Kok Street in Tsuen Wan where its factories were located. Over time, Metex shifted its focus to the manufacturing of intimate apparel and as the cost of production rose in HK, it moved its production to Sri Lanka. The entire Metex House was sold for HK$450 million in June 2017. 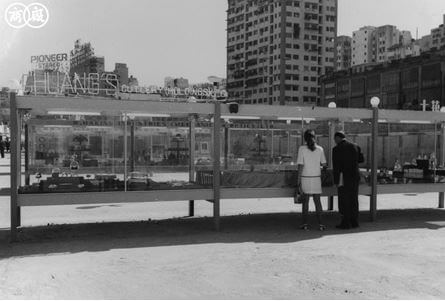 Good Friend Industries (Cutlery) Ltd was incorporated in 1966, although it was started much earlier since they had an ad in the 1961 HK Trade Bulletin which listed their offices at Comfort Building on Nathan Road in Tsim Sha Tsui and its factory at Po Kong Village Road in Diamond Hill. Aside from stainless steel cutlery, it was also involved in the manufacturing of bronze and nickel silver cutlery. In 1970, Good Friend relocated its plant to a 20000 sq ft site in Fu Yung Shan (芙蓉山) in northern Tsuen Wan and by 1978 it was employing over 200 workers and doing sales of HK$10 million a year, being one of the two cutlery manufacturers left in HK (the other being the much bigger Chuang’s Cutlery). In February 1978, the government notified Good Friend that they were taking over their factory site (along with sites of 20 other factories in the area) as part of re-development. Although compensation was provided, Good Friend were unable to find another site to continue production as of September of that year. It is unclear as to when Good Friend actually suspended production but the firm was dissolved in 2003. The author cannot locate any info about the founder or owner of Good Friend so any additional information about the firm would be much appreciated much appreciated. This article was first posted on 8th September 2017.